An insanely expensive, though cool looking, Stryfoid. 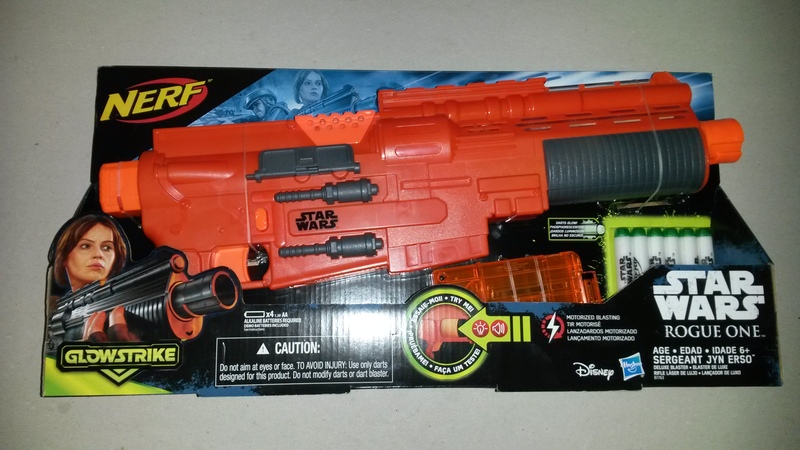 As part of the merchandise lines for Rogue One, Hasbro produced and released multiple new Star Wars blasters. 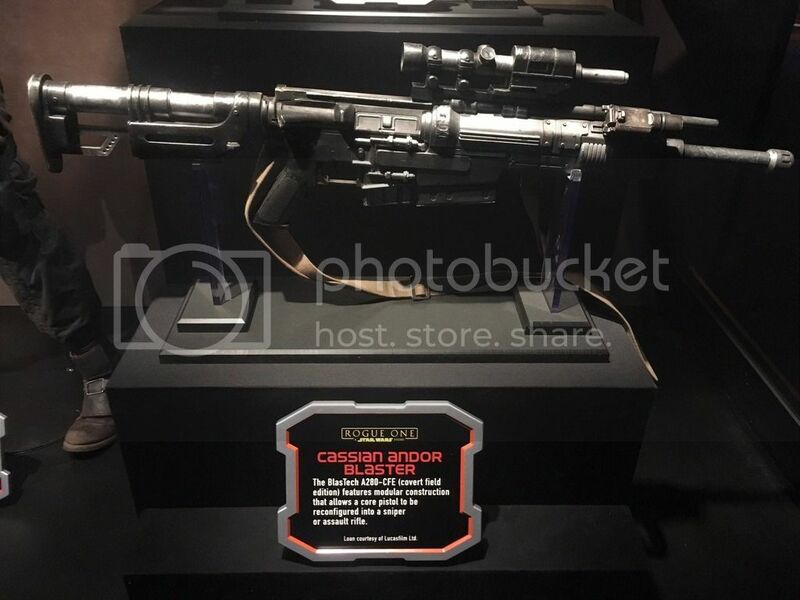 The blaster in question, the Jyn Erso blaster, is the largest and most expensive of the ones slated for general release, and was the only one of the three that presented anything of interest to me. It took a 50% discount for me to even consider buying one, but even at that price, is it worth the money? 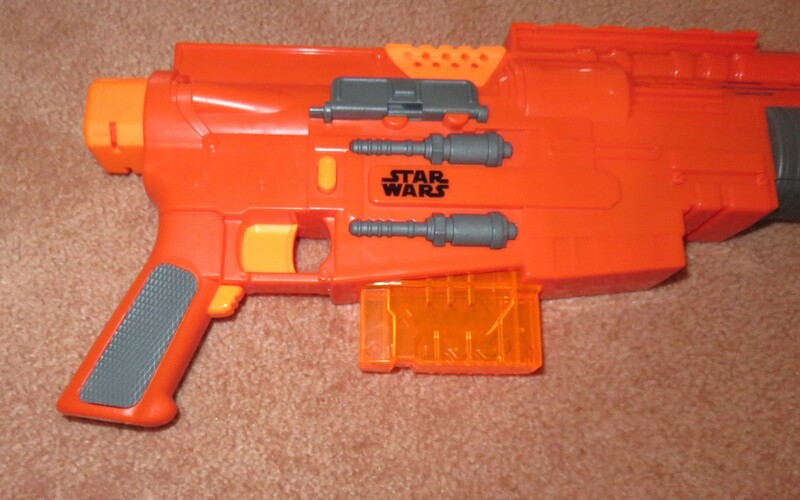 The Jyn Erso blaster is based off of the A280-CFE blaster rifle. 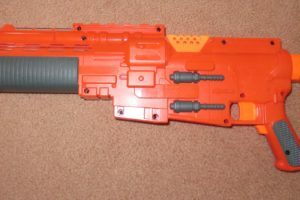 The blaster rifle is a modular one, being disassemblable into multiple components, including the stock, barrel and scope. 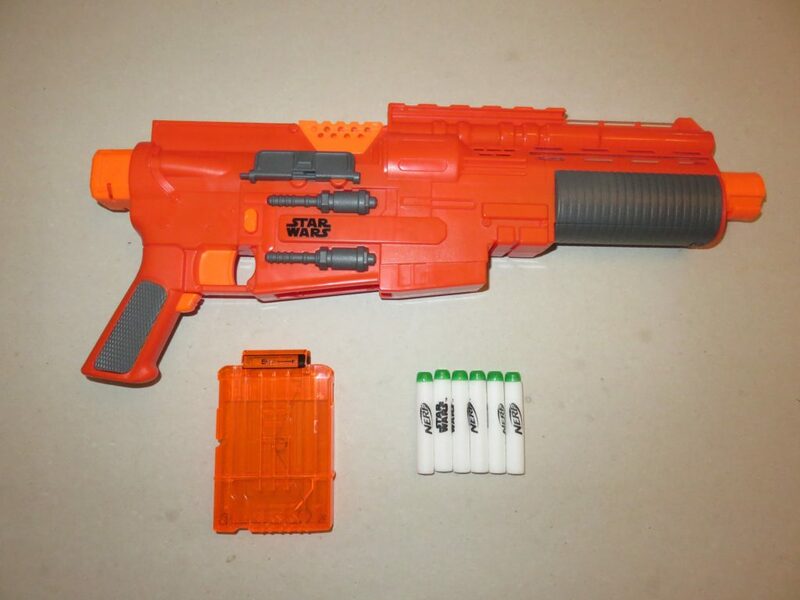 This modular construction makes it ideal for a Nerf blaster with multiple attachment points. 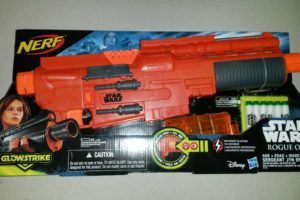 The Jyn Erso blaster replicates only the base blaster, however the Cassian Andor Deluxe blaster is a blue version that includes a barrel, stock and scope (all repainted Nerf parts). 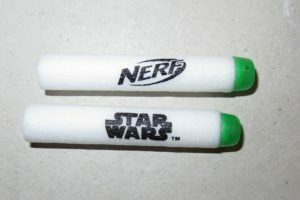 Close up of the logos on the Star Wars darts. A look at the darts while glowing. 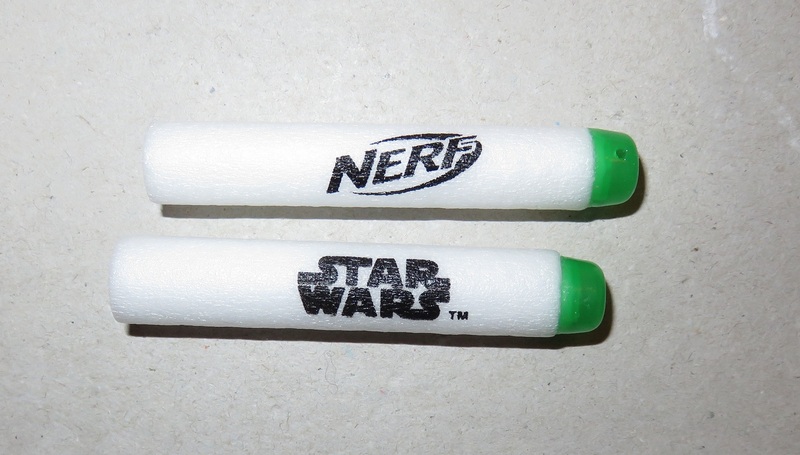 A quick look at the included Star Wars darts. 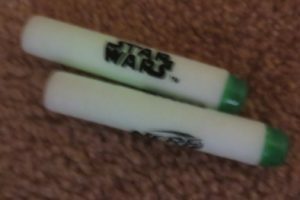 Unlike the Force Awakens blasters, the Rogue One blasters all include the same dart, a white body, trans-green tip Elite. 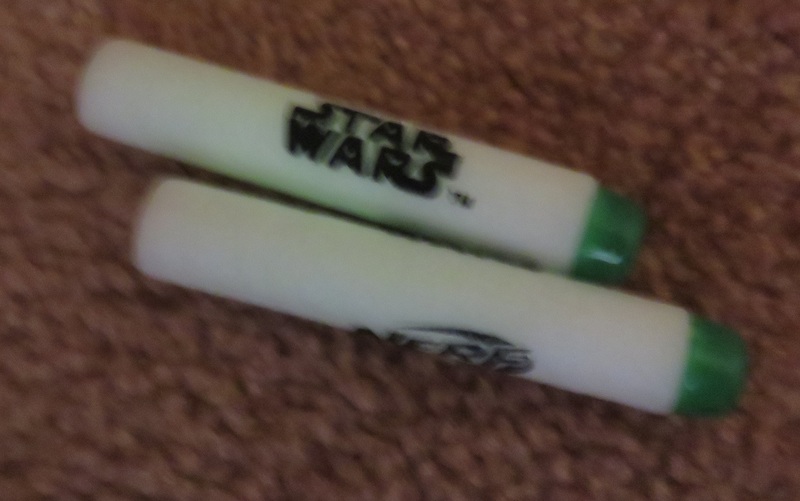 In exchange for sacrificing in-universe accuracy (all the Rogue One blasters in-universe fire red blaster bolts), the Rogue One darts glow in the dark. Each of the Rogue One blasters features some kind of light system that charges loaded darts. 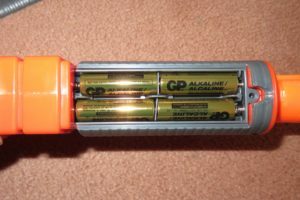 Like with older glow-in-the-dark Nerf darts, these darts do not hold their charge for very long, however the effect they provide is a neat and fun gimmick. 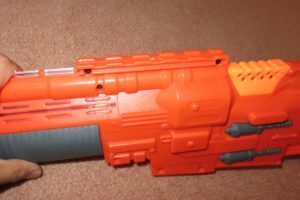 A look at the unique 6 dart mag. 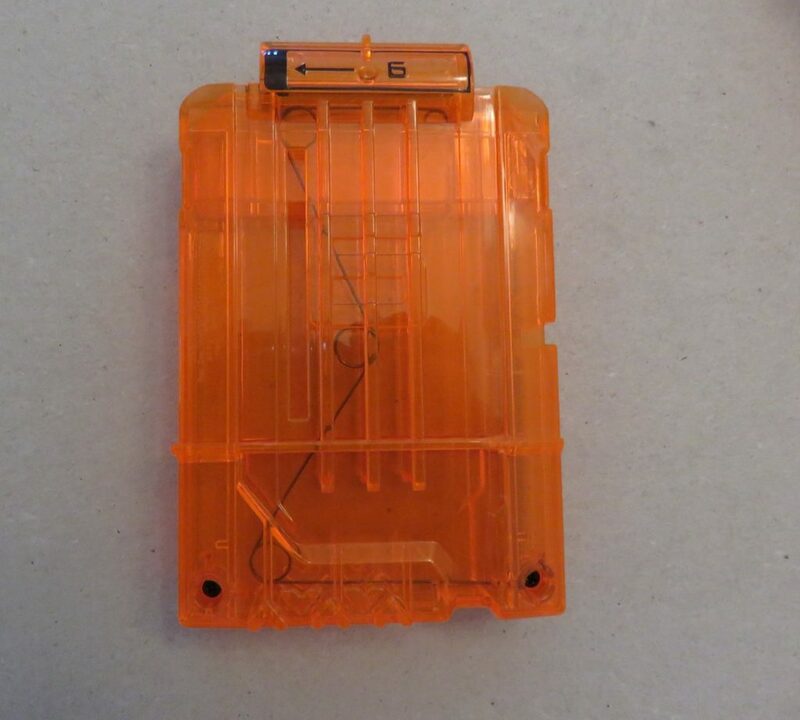 The included 6 dart mag is also worth a quick mention, as it is the first full trans-orange Elite mag. 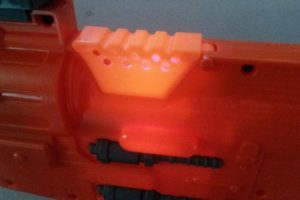 Typical Elite mags have an opaque left side, which would inhibit the charging of the GITD darts. 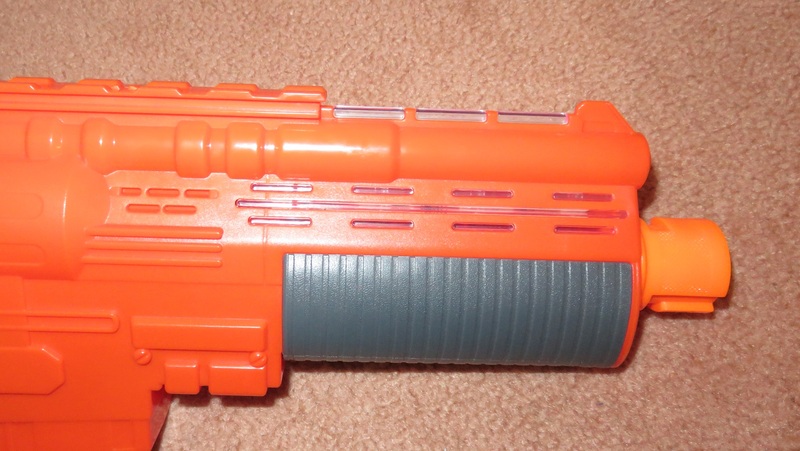 Right side of the blaster. 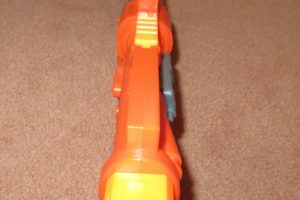 Close up of the tac rail. Looking at the stock attachment point. Close up of the muzzle. 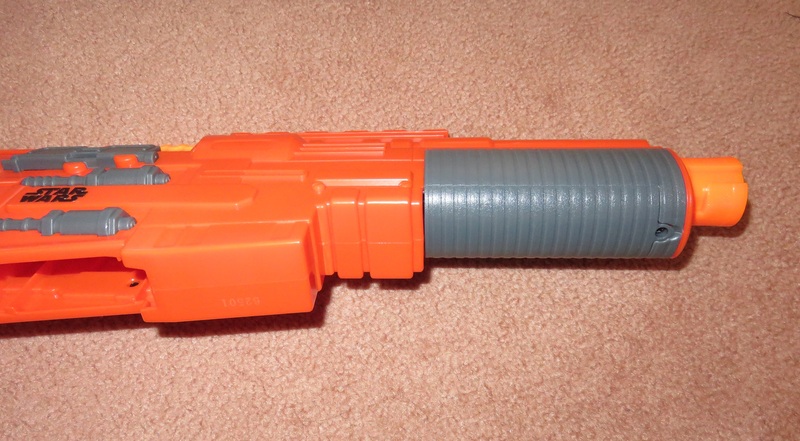 The Jyn Erso blaster is a surprisingly large one, with a very long barrel. It has many molded details, as well as grey plastic inserts rather than paint. It also has a number of features that you may recognise from real-life firearms, since the A280-CFE was built from real-life firearms. 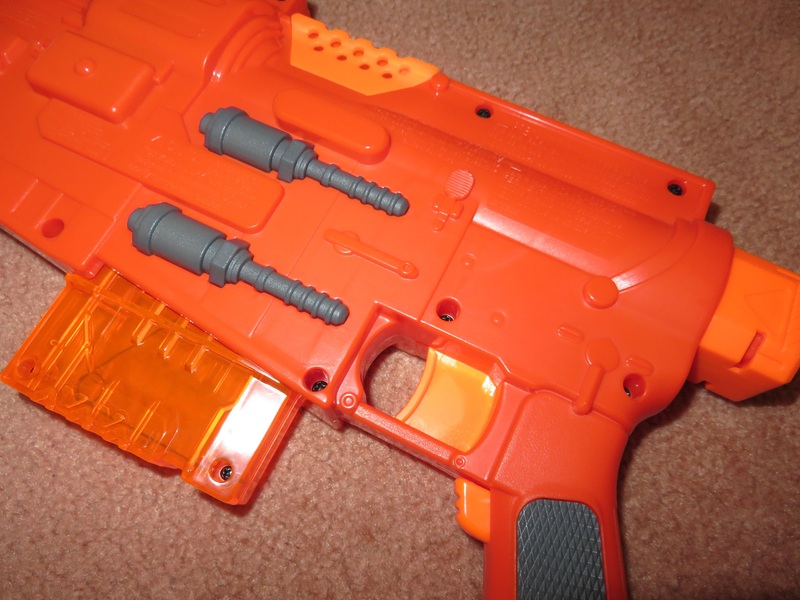 The blaster has a single tac rail on top, right in front of the magwell. 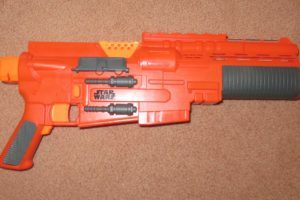 While this placement is rather unusual by Nerf blaster standards, it corresponds fairly accurately to the scope placement of the A280-CFE. 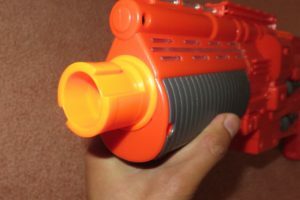 The blaster also accepts stock and barrel attachments, however most barrels will be loose due to the lack of locking divot below the muzzle, and general lack of supporting plastic. Close up of the jam door. Looking into the jam door aperture. 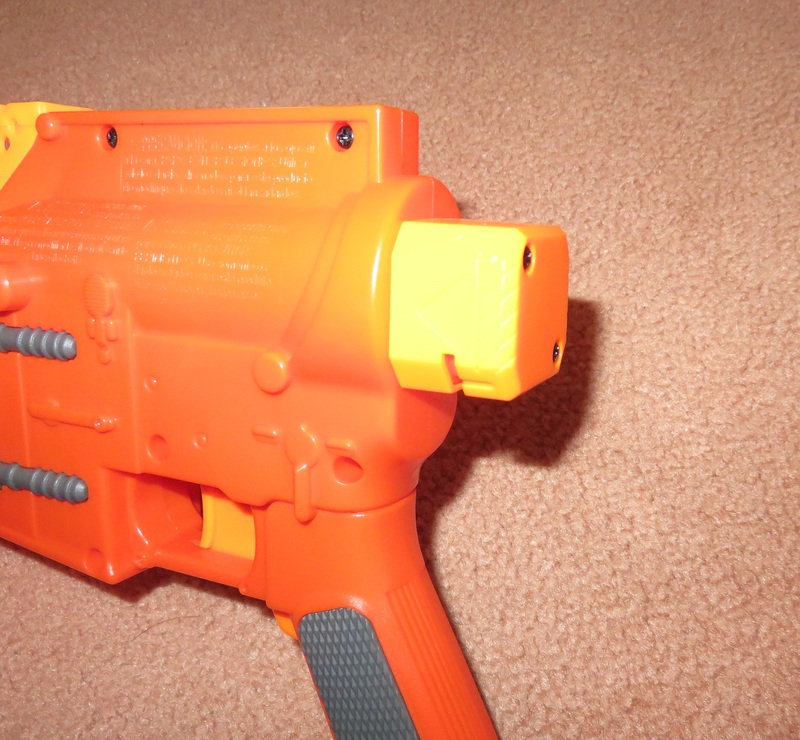 The blaster features a flip-up jam door. 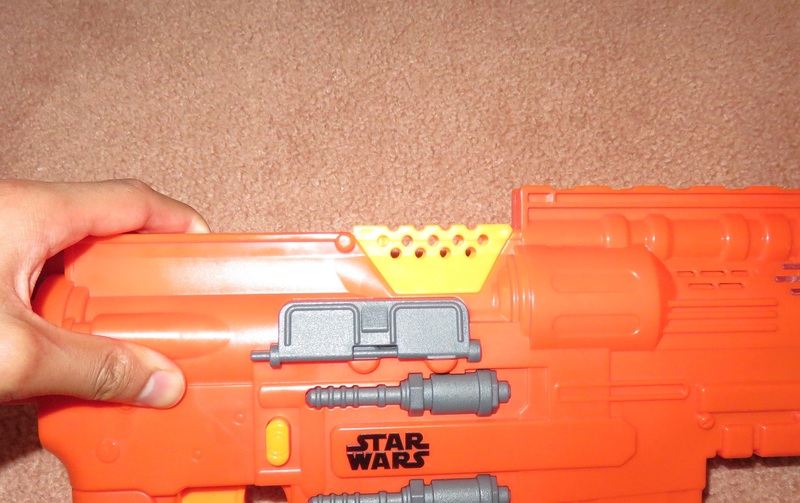 This particular jam door is rather poorly designed and placed, as this area of the blaster is the thinnest. As such, the jam door aperture is very narrow, and difficult to access and use. Furthermore, certain tac rail attachments such as scopes may prevent the opening and use of the jam door. Close up of the handguard area. A look at the battery tray cover. 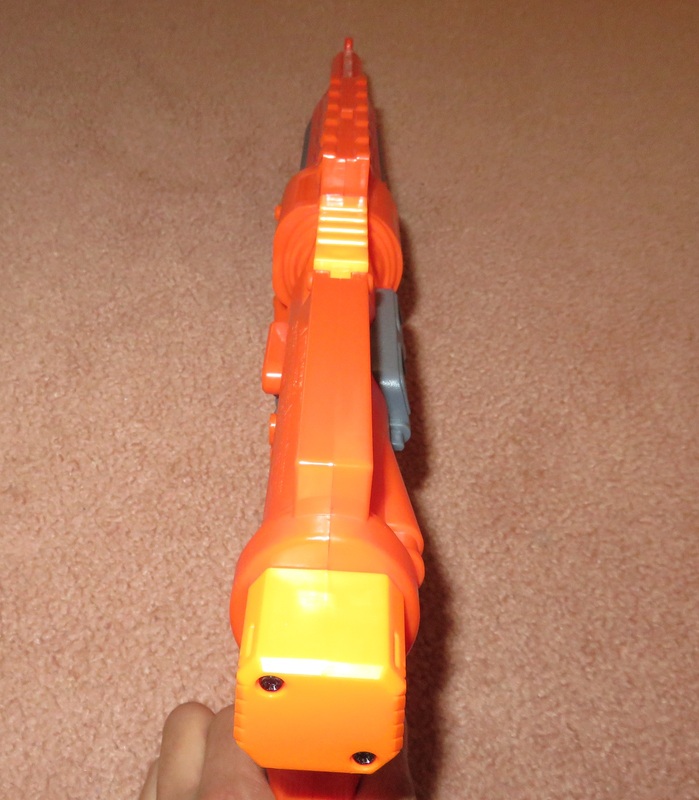 A look from below at the foregrip. The fore end of the Jyn Erso blaster is quite tall. 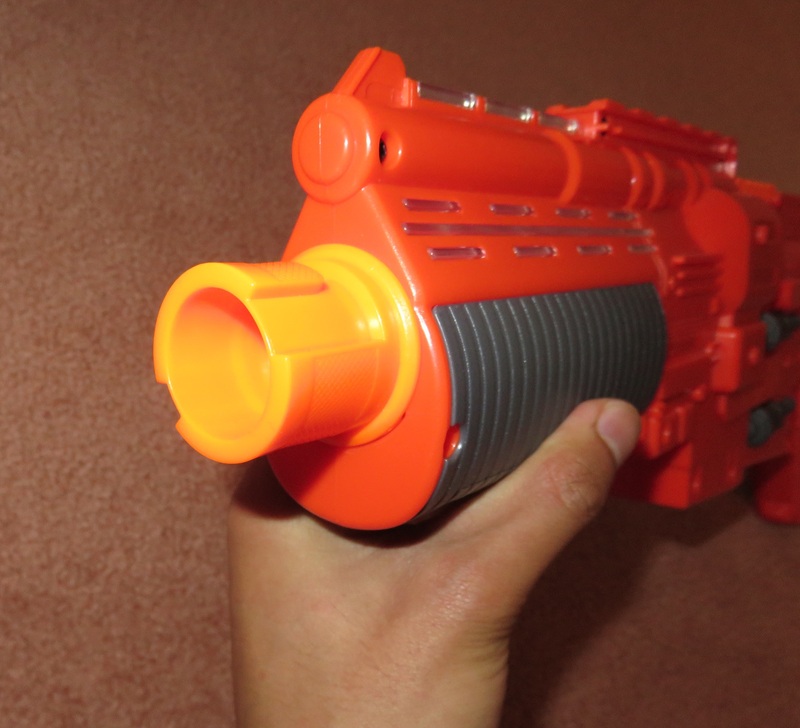 The lower section is dedicated to a rounded foregrip, while the upper part is dedicated to the lighting system, with a speaker further back. 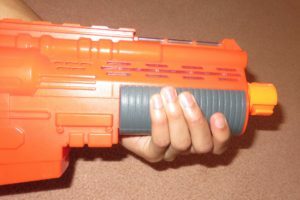 The lights and sound system activate on trigger pull, with the lights turning on in sequence to simulate the firing of a blaster bolt. 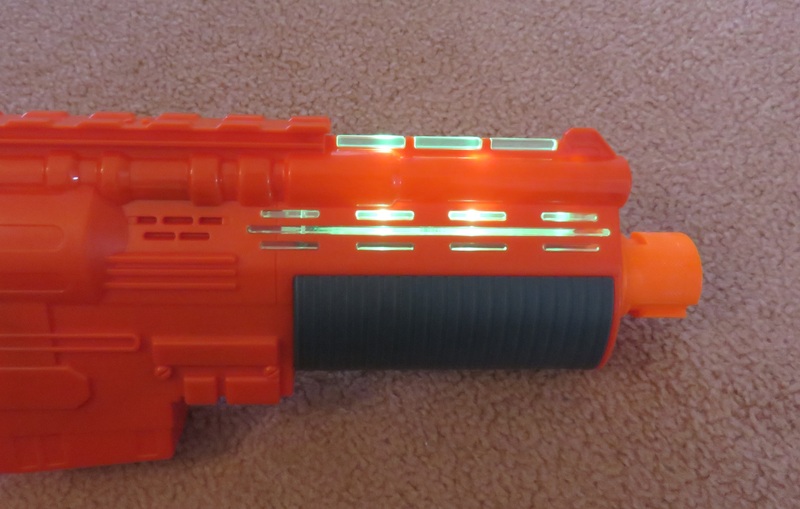 This feature is testable even when the blaster is still in box, as the blaster is supplied with batteries. 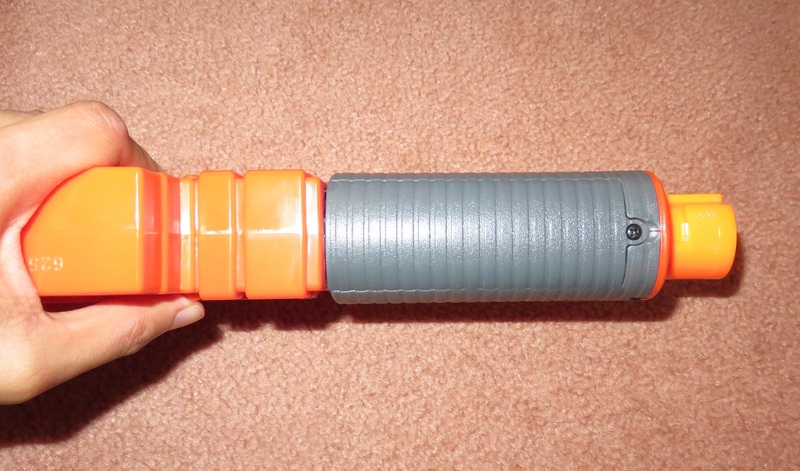 The round foregrip is fairly well designed, being of decent length and width. 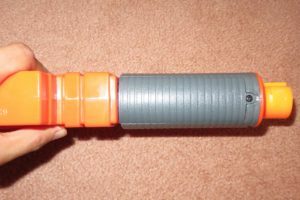 It offers a fairly comfortable grip design, however I personally find it far too far forward to hold comfortably with a typical two hand grip. 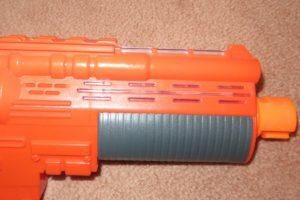 The foregrip is about 11cm forward of the magwell, which is far more forward than the typical foregrip of a Nerf blaster. 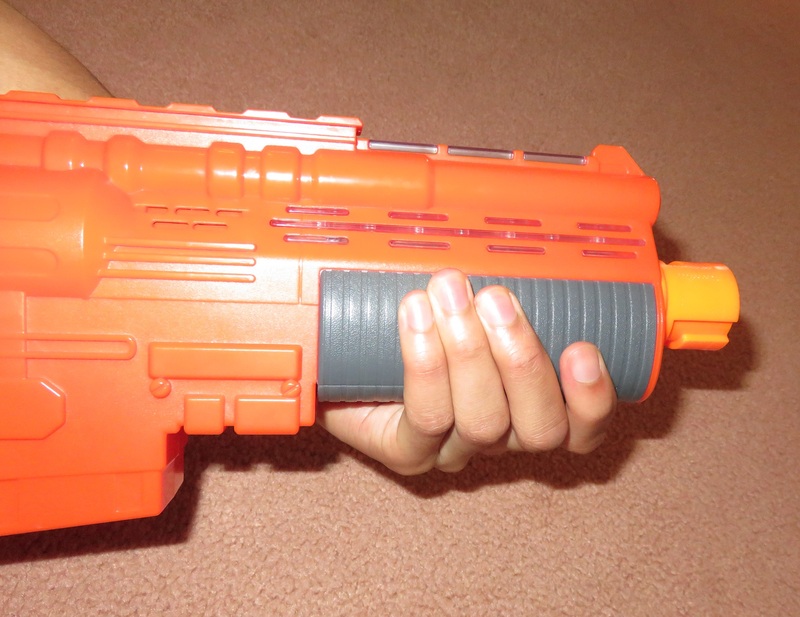 This foregrip placement is accurate to the source material of the A280-CFE however. 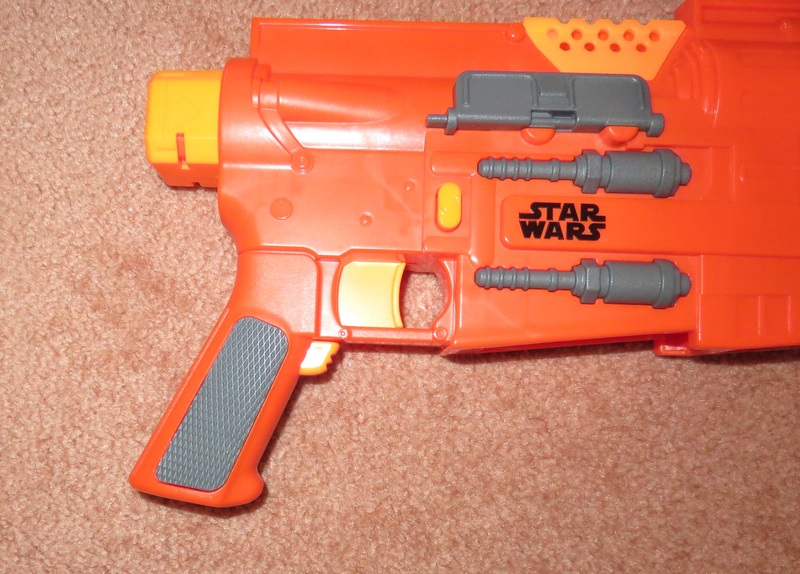 The foregrip also contains the battery tray for the blaster, holding 4 AAs in a 2×2 configuration. This adds a fair amount of weight to the front end of the blaster. The area between the magwell and foregrip is designed to emulate the same area on the A280-CFE. As mentioned just above, I personally find the foregrip too far forward to use comfortably, preferring to have my off hand just in front of the magwell. These rectangular shapes between the magwell and foregrip are quite uncomfortable and awkward to hold however. Close up of the handle area. 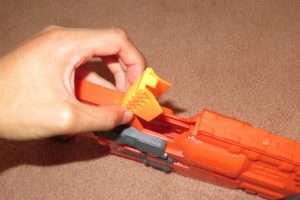 Close up of the magwell. Reaching for the mag release. No mag release on the left side. The handle of the Jyn Erso blaster is quite different from typical Nerf blaster styling, instead emulating a more realistic design. The handle also has rough grey texturing pieces inserted on either side. I personally find it fairly comfortable to hold, however it is quite thin, and if you have larger hands, you may find it too small. 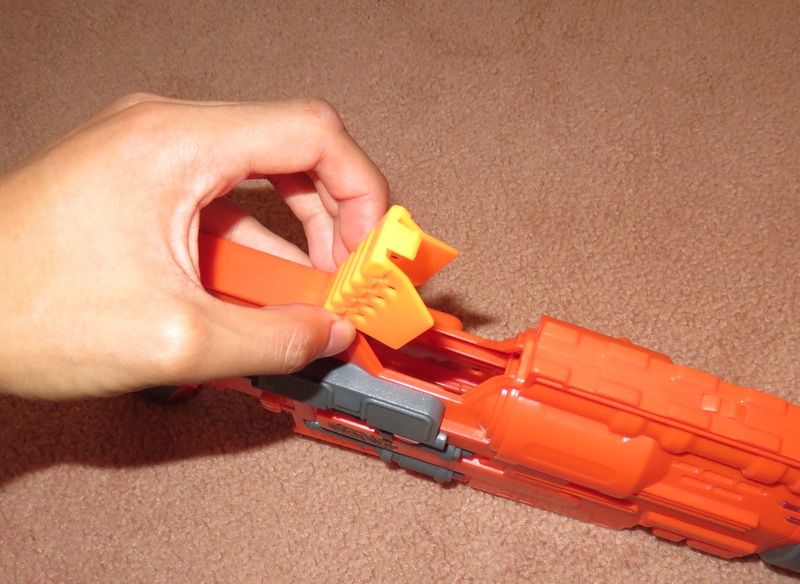 The magwell of the blaster almost lines up with the faux magwell design on the shell. 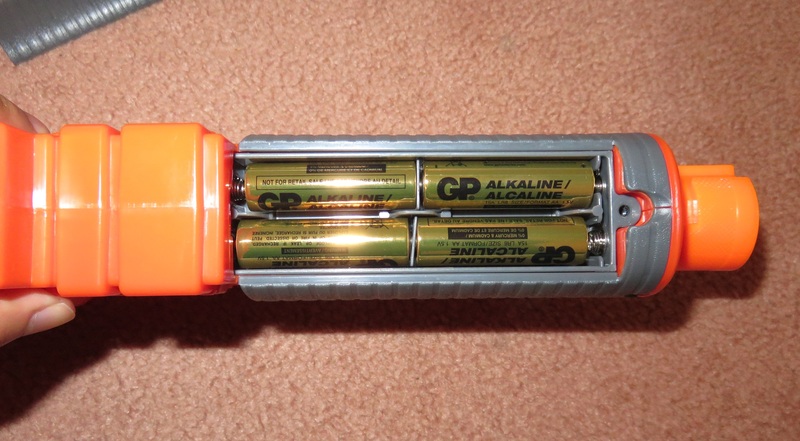 It supports the use of Nerf’s other mags and drums without issue. 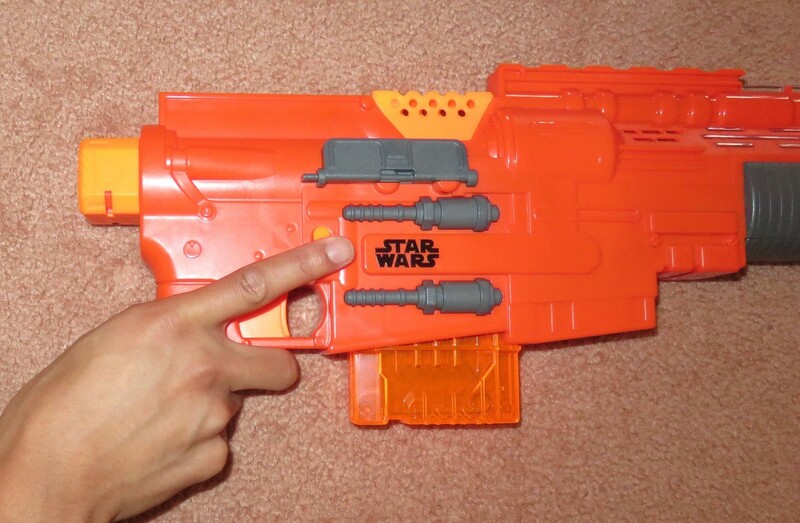 The mag release is a button, and is only present on the right side of the blaster. 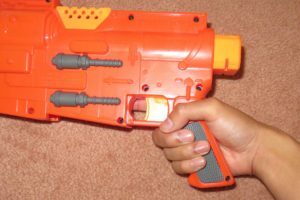 Holding this button down allows easy removal of the currently loaded mag. 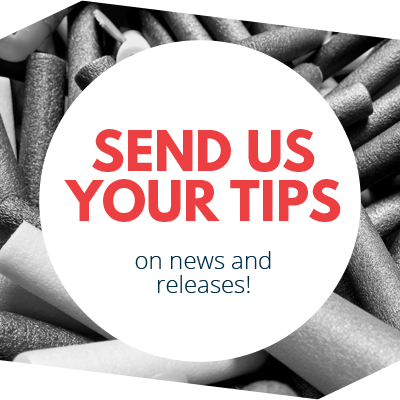 This mag release is easy to use for right-handers, however presents a major challenge for left handers, as the button is quite high up and is difficult to reach with your off hand. 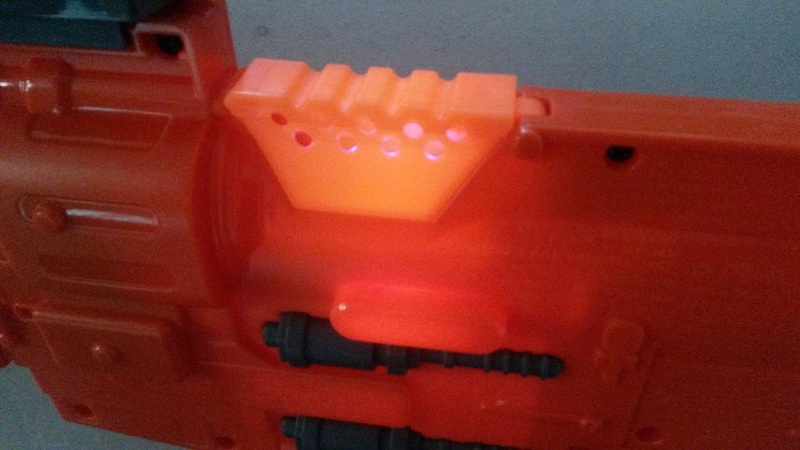 The magwell also contains two LEDs, which are turned out when the acceleration trigger is pressed. 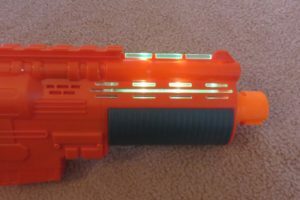 These LEDs charge any glow-in-the-dark darts that are loaded near the top of the mag. 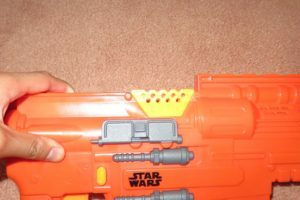 Jyn Erso Blaster next to a Stryfe. 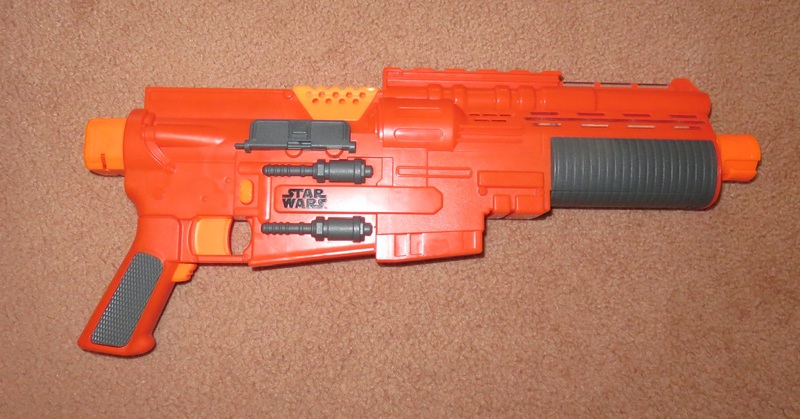 As mentioned previously, the Jyn Erso blaster is quite a big blaster. 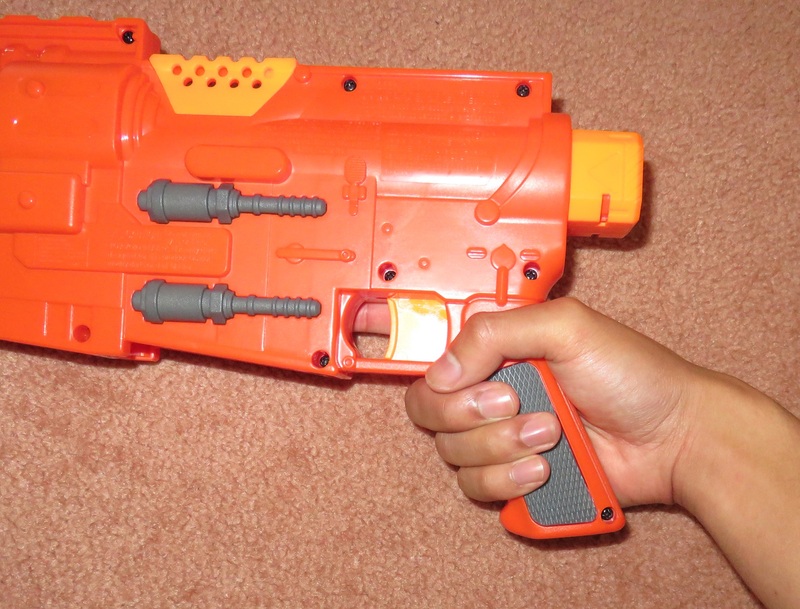 It is substantially longer and bulkier than a Stryfe. 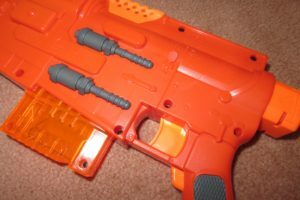 Due to the placement of the battery tray in the foregrip, it is also a lot more front-heavy and unbalanced, especially without a stock. 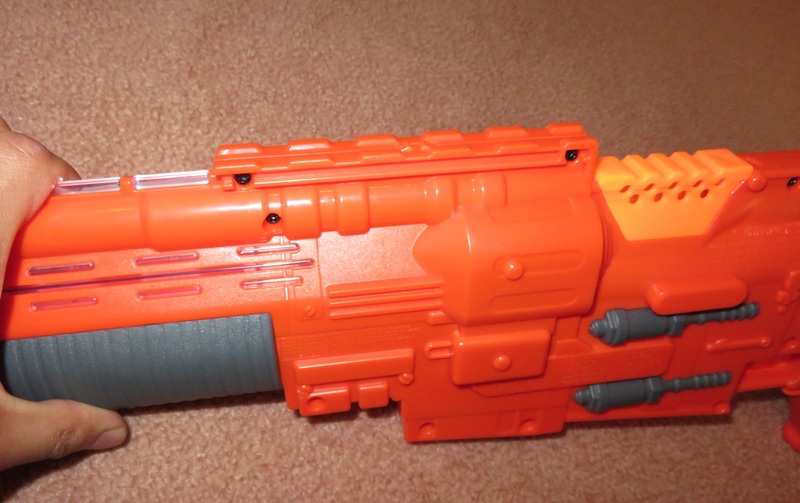 In terms of barrel length, it even beats the Rapidstrike for barrel length, which is already a fairly long blaster. 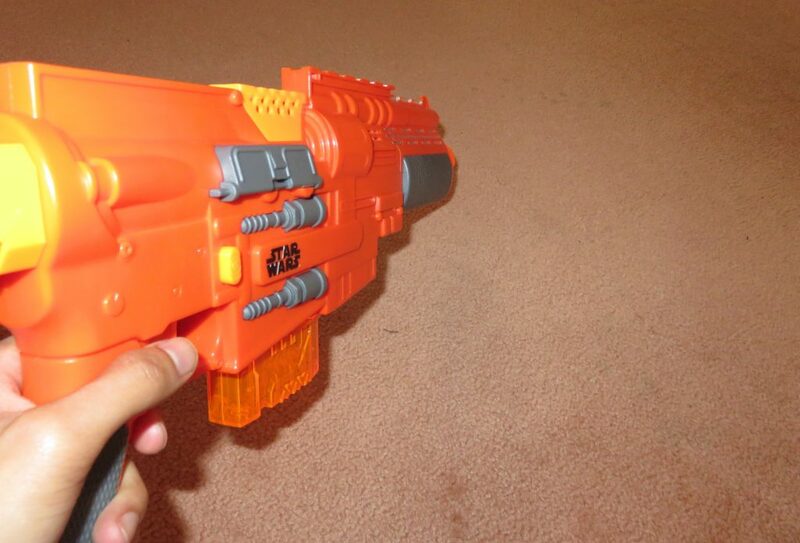 First person view of the Jyn Erso Blaster. Range wise the Jyn Erso blaster is capable of around 7-9 metres parallel to ground. 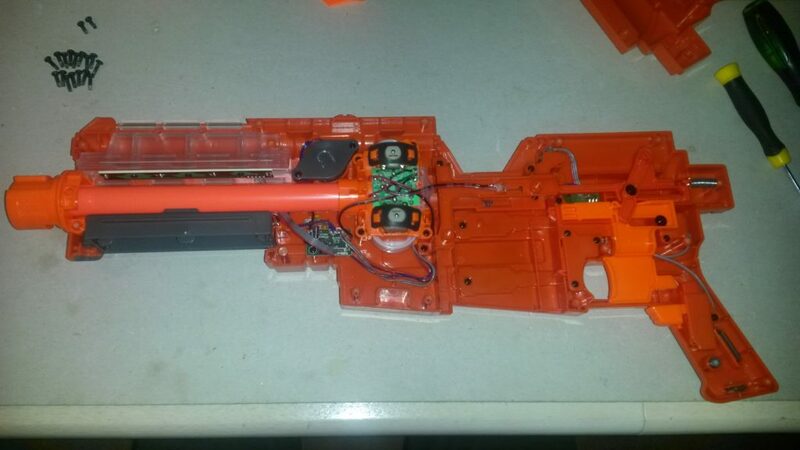 This puts it pretty much on par with most grey trigger flywheel blasters. In terms of muzzle velocity, it averages about 50fps, with minimal deviation. Naturally the Jyn Erso blaster requires several seconds of rev-up to achieve maximum range, and loses a lot of range during rapid fire. Accuracy is not particularly good, with a lot of darts drifting sideways when using the included darts. 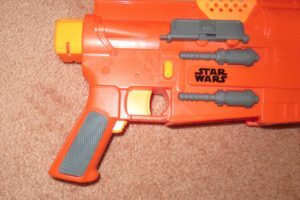 I’d estimate it to be slightly worse than a typical grey trigger Elite-era blaster. 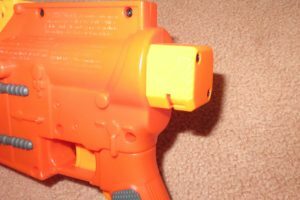 Rate of fire, like with Nerf’s other semi-auto flywheeler, is entirely dependent on trigger technique. 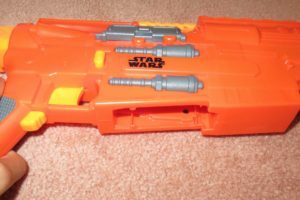 A ROF of 5+ darts per second is certainly possible, though not sustainable with a stock blaster. The most you can achieve with a stock Jyn Erso Blaster while maintaining decent range is about one dart per second. 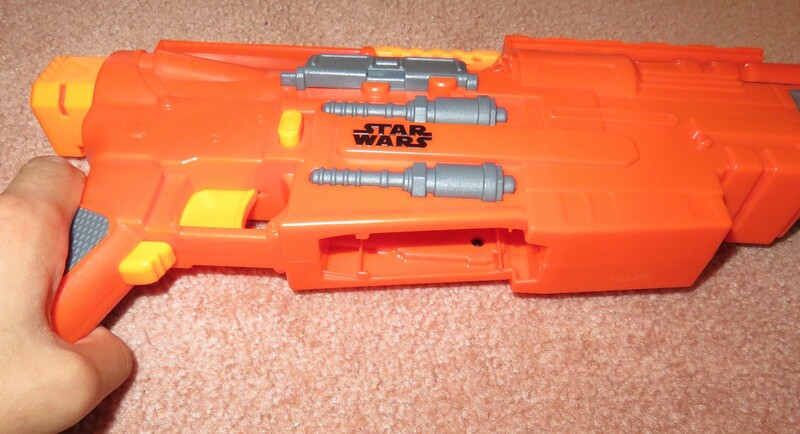 The Jyn Erso blaster functions just like any other stock semi-auto flywheeler, performing best in close quarters. At close range, its rev-up time is less of an issue, as is range loss during rapid fire, allowing you to exploit its high ROF to full advantage. The Jyn Erso blaster’s length may pose a maneuverability issue in close quarters however. As per usual for a stock flywheeler, it suffers heavily in longer ranged combat where spin-up time and range loss becomes much more significant. 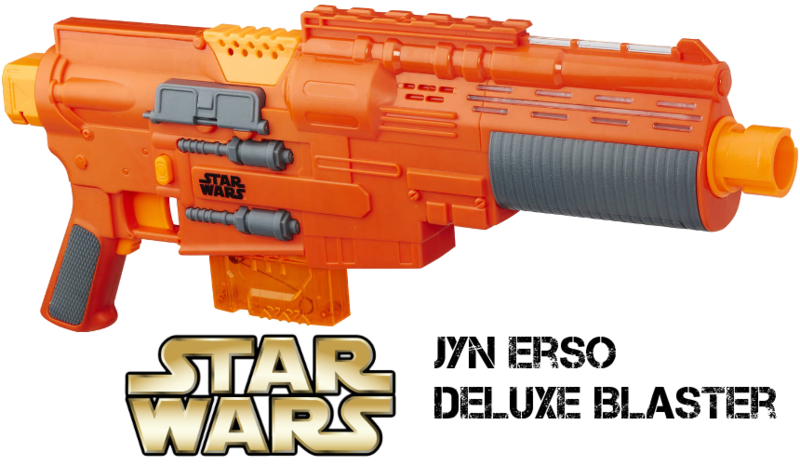 In Australia, the Jyn Erso blaster retails for around 90AUD, with sales typically bringing it down to around 60AUD. I personally bought mine for 45AUD, half price at BigW. Even for that discount, I don’t feel that I got a very good deal. 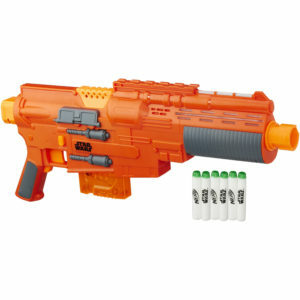 Considering the Stryfe retailed for a mere 25AUD, the Jyn Erso blaster does not offer a whole lot at its price point. Sure the lights and sound system is a neat feature, and its shell design is quite unique, but I cannot find any reasonable justification for its price. 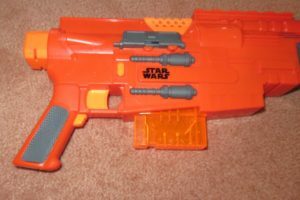 Unless you absolutely love its lights and sound system, or its shell design, I would suggest saving your money for another blaster. Besides the lights and sound system, the Jyn Erso blaster is a pretty standard semi-auto flywheeler. As such, performance wise, it can reach the same level, 110+fps with a full internal overhaul. With a regulated voltage (around 5V should work fine) and possibly some RF suppression, the lights and sound system should work fine alongside the upgraded internals. Of course, the lights and sound system could be easily removed or disabled if undesired. 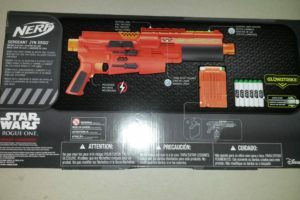 This entry was posted in Dart Blasters, Reviews and tagged blaster, deluxe, erso, jyn, nerf, review, star, wars on April 28, 2017 by Outback Nerf. 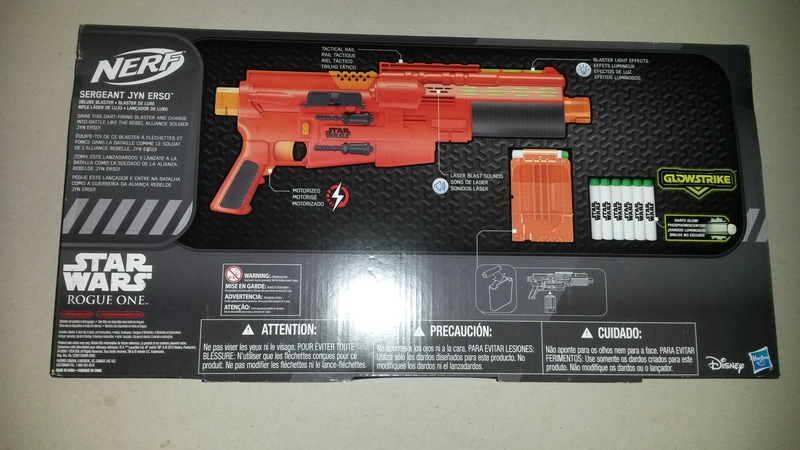 I bought the Deluxe blaster which is a whole lot better than what you’re describing. 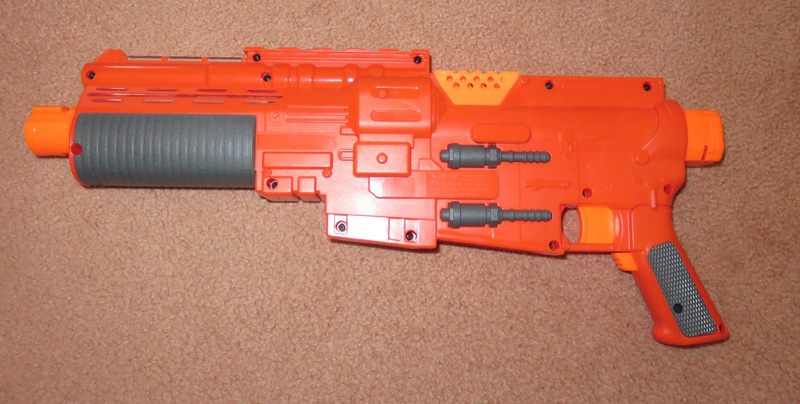 It came with the Spectre barrel suppressor, the Raider stock, and the Modulus long range scope. 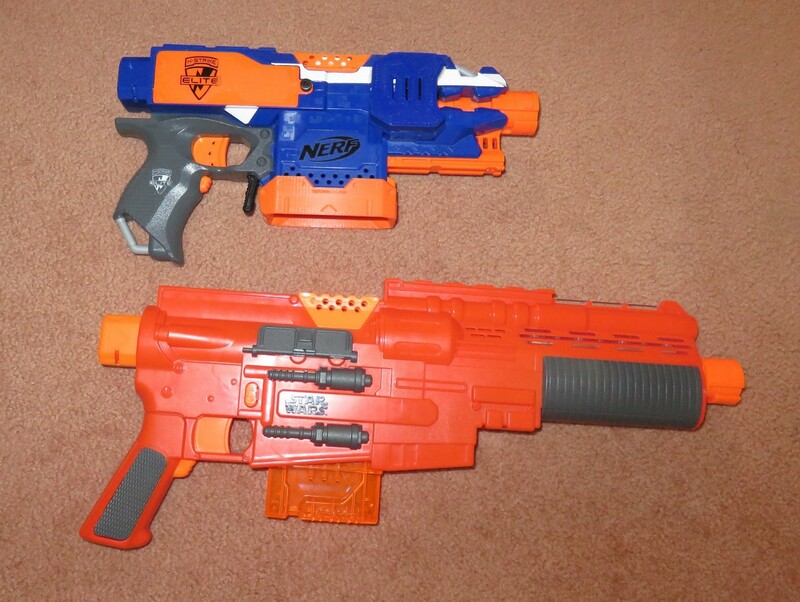 All of them are reskinned in blue and now match (to an extent) normal Elite blasters. I bought the Deluxe model for 80USD and would highly recommend it over the regular version (which I have never seen in stores). 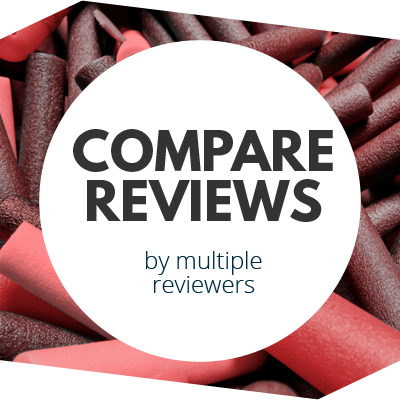 From what you’ve said and from my own extensive testing, it achieves slightly better ranges. 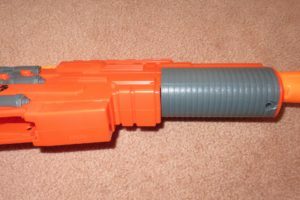 The barrel addition hold firmly, though not as well as other blasters, and is wider on the inside than the blaster barrel.